Patterns of Embroidery is a fabulous way to add a personal touch to your project! Embroidery is something that anyone can master. For hand embroidery, you need just simple supplies for it and that is a fabric, a needle, a floss and a hoop! That’s it. However, same rule doesn’t apply for machine embroidery. You can use any kind of fabric and using standard cotton floss is a great thing. However, it allows for easy and complete control over thickness of the stitched lines. They add a great texture to your stitches. And the needles with large threading eyes will make the things much easier! And the embroidery hoop will keep the fabric tight so that there will be no wrinkles into your fabric. If you’re a beginner then you should start with simple patterns of embroidery, that is alphabets, which are easily available in your own computer. You just need to type the words, choose the fonts and size and just print it out. 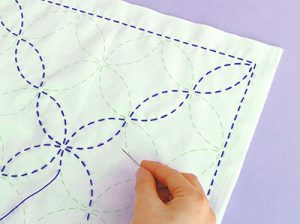 Now just simply transfer your pattern onto the fabric there are several methods available to do that so. Once the pattern is transferred you can start the stitching process. A basic backstitch is a great place to start. No matter what, embroidery is a beautiful and a versatile craft that requires only few basic supplies. However, patterns of embroidery can also be transferred from a computer to the embroidery machine by using a USB media. Here at DigitEMB, we offer a wide range of patterns of embroidery. You can find all the solutions of your embroidery problems here. We have professional and creative artists who can assist you in each step of the way. We believe that the satisfaction of our customers is our success. So, we do our very best to make the best patterns of embroidery for you. Here at DigitEMB, we offer a wide range of patterns of embroidery. You can find all the solutions of your embroidery problems here. We have professional and creative artists who can assist you in each step of the way.